This amazing Jester Bag Kit has to be seen to be believed! Closed with a striped I-cord drawstring, it can be opened fully ensuring that nothing can ever get lost in the bottom. The jingle bells are not only fun, but increase security as you will soon hear if someone tries to move your bag. The kit contains 200g of British wool in each of two colours and four jingle bells. Two colour options are offered — Blues and Harlequin. Occasionally a limited edition third version is available too. These kits come with a natural Kraft brown carrier illustrated by a large decorative Sheepfold label on the front and a photo label tied to the handle to show the finished bag — ideal as a gift either as a kit or as a completed item. To knit this wonderful bag you will need a pair of 5.5 mm knitting needles, not to mention an enthusiasm for British wool! The striped I-cord is knitted with 4.5 mm double pointed needles. A small amount of waste yarn is useful too. The ‘hard work’ of felting is easily done in your washing machine; such is the simplicity of knit-and-felt. 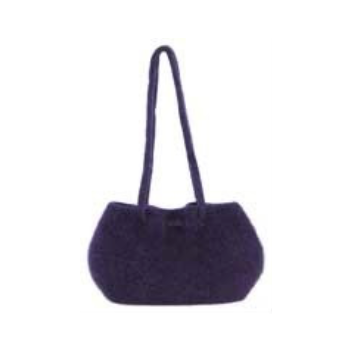 The finished size of example shown is approximately 25–28 cm x 11 cm x 25–28 cm (width x height x depth) depending on how far you take the felting process; ideal for use as a handbag, or as a project bag for your next creation.